This is not a rock hard acrylic or thin clear plastic material. Our semi-hard material 2mm may also be used as a retainer. Our semi flexible custom designed Armor Guard professional dental day night guards come in 2 different materials of your choice. First is our semi flexible soft EVA material that is recommended for light to moderate grinding and clenching with no TMJ symptoms. It is also for those who prefer a little softer cushion feel when they grind and or clench. The second is our semi flexible hard material, It is designed for light to heavy grinders and or clinchers. It may also help relieve some or all of your multi symptoms like headaches,soreness in the jaw muscles, ear, neck and jaw issues. It is an extremely durable, dense harder semi flexible EVA material with a no give or cushion harder feel. Our soft material shown above comes in a clear color and a standard 3mm thickness for comfort and durability. We also offer a 2mm and 2.5mm thickness for users that prefer or need a thinner dental day guard. Our semi-hard material is cloudy in color also your choice of thickness in 2mm, 2.5mm and 3mm. If you have a previous mold from your dentist you can send us your mold to make your custom dental day / night guard or retainers. Pro-form Logo is for demonstration only. Armor Guard is proud to provide exceptional customer service throughout the entire custom process, to ensure that you're 100 percent satisfied. Please note sometimes just like at the dentist final adjustments may be necessary once you receive the final product as this is a normal final step in the custom process. We encourage our customers to work with us to resolve any impression or fitting issues that may arise since you are making the teeth impression. Our products are easily adjustable once you receive them unlike an acrylic or plastic material. This purchase is for an impression kit to assist us in the first process in manufacturing your two upper or two lower custom professional dental day night guards with cases, for the SAME mouth. If you would like a combination of upper and lower please contact us after you place your order to process your custom request. Final product is included in the price. Our Armor Guard Pro-form day and night mouth guard is the brand used most by Dental professionals today. This is not a generic over the counter boil and bite, yet a high quality custom professional dental day and night guard. The same product at the dentist will cost you an average of 500 dollars each. Does not contain BPA, allergen and child friendly. 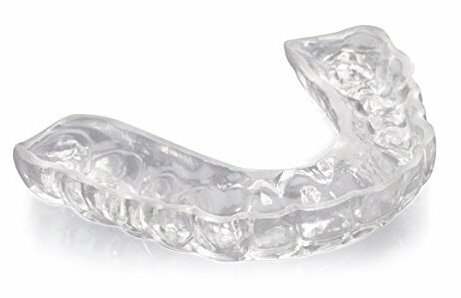 Our semi flexible custom designed Armor Guard professional dental day night guards come in 2 different materials of your choice. First is our softer EVA material, that is recommended for normal grinding and clenching only. It is also for those who prefer a little softer feel or cushion, when they grind and or clench. The second is our harder material, designed for normal to heavy grinders and or clinchers with or without TMJ like symptoms. It is an extremely durable, dense hard semi flexible EVA material, with a no give or cushion hard feel. This is not a rock hard fragile, or uncomfortable acrylic material. Both of our materials come in standard clear color and a standard 3mm thickness for comfort and durability. We also offer a 2mm and 2.5mm thickness, for users that prefer or need a thinner dental day night guard. If you have a previous mold from your dentist, send us your mold to make your custom dental day and night guard. Logo is for demonstration only. Please read the product description below for more details. Please ask about our expedited rush service for faster service. Please read product description below for more details.Check out our other Armor Guard offers by clicking on the Armor Guard link above, just below the product title. If you have any questions about this product by Armor Guard, contact us by completing and submitting the form below. If you are looking for a specif part number, please include it with your message.